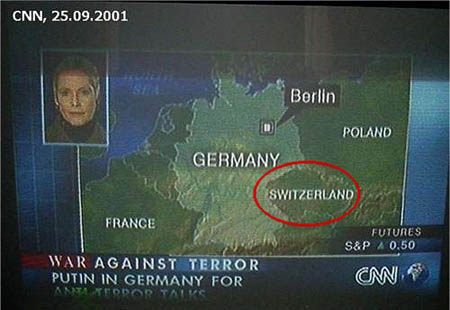 I think I could teach a geography class based solely on shocking people. I’d call my series Geo 203: It’s Not Where You Think It Is. I last took geography my freshman year of high school and I haven’t looked back since. I remember my teacher Mr. Markosian took pains to emphasize that geography isn’t just capitals and rivers, but the effects that physical features have on the development of history and culture. Those complex relationships were lost on us. Maybe should have focused on some more basic questions. Cue the slides. Lesson 1: Where is South America? This is a map of the United States of America, plus a little of Canada at the north and Mexico to the south. If that’s not clear to you, give up now. The U.S. is part of North America. Naturally, South America is to the south. Here is the same map, but with some lines of longitude. 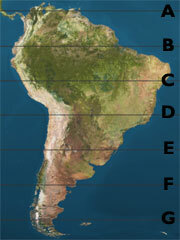 Which of these lines run through South America? Lesson 2: Where is the equator? You know the equator. It’s the imaginary line that marks the middle of the world, north-south-wise. It’s the part of the world that receives the most direct sunlight. It’s encircles 24,901 miles. But where is it? Here are two maps, one of South America and the other of Africa. Identify the equator on each map. If the result surprises you, look at a map and note the relative positions of South America and Africa. 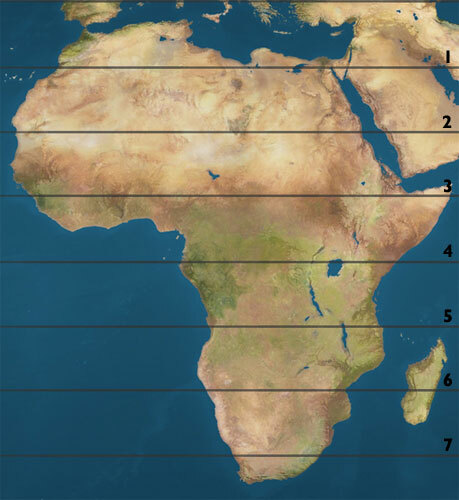 I was shocked myself when I realized the positions because it means that, at my current location in Santiago, I am farther south than all of Africa. Lesson 3: Is what Ambrose Bierce said true? What Ambrose Bierce said is this: “War is God’s way of teaching Americans geography.” We’ve been at war in Iraq and Afghanistan for over four years. 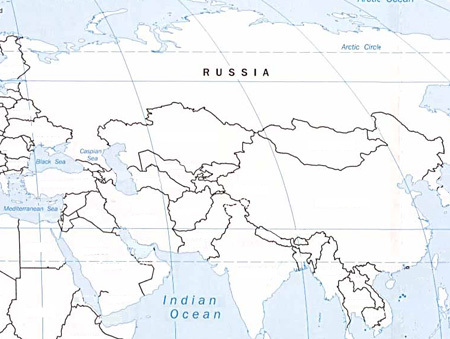 What percentage of Americans could identify these two countries on an unlabled world map? Here’s a map for you to try. Click if you need a larger version. I have to admit that I wasn’t able to locate either country myself when I first tried; I had to look up the answer. If you were able to do it, congrats—you did better than I did. I don’t have any numbers to back me up, but I’m pretty sure that most Americans would have some difficulty finding Iraq and Afghanistan. Perhaps a more accurate aphorism would be to say that war is God’s way of making Americans aware of other countries’ existence. Study up for the test. 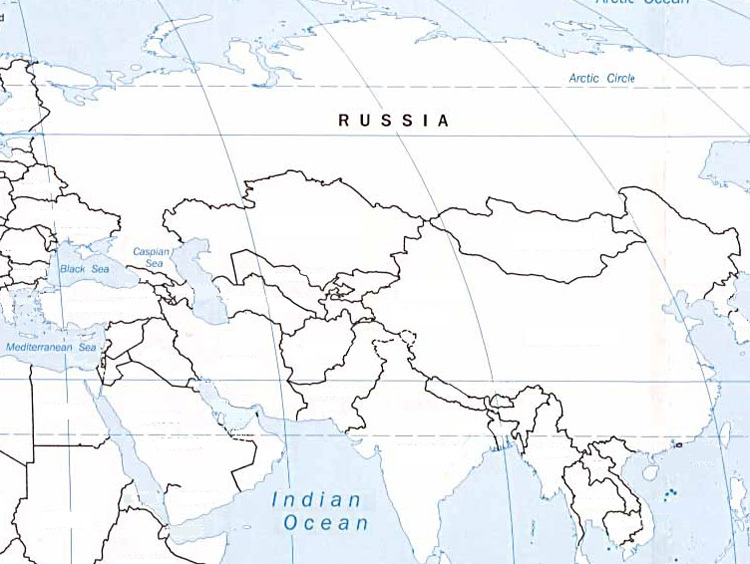 Focus on the location of South America, the equator, Iraq, and Afghanistan. There will be no curve. FWIW, I got both right before checking the answers. 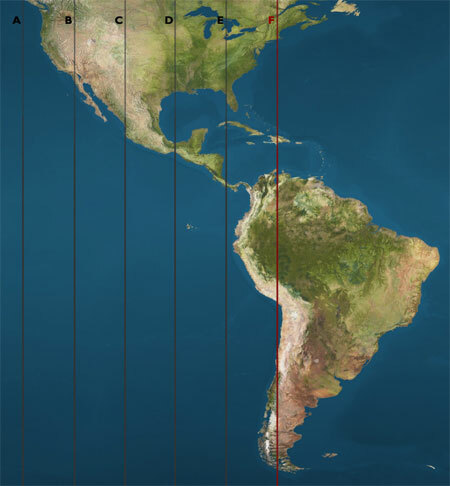 The equator hardly a “trick” question simply because you put the two maps side-by-side. It’s obvious that Santiago is more-or-less at South Africa’s latitude because both regions are major wine producers, requiring that similar climate. 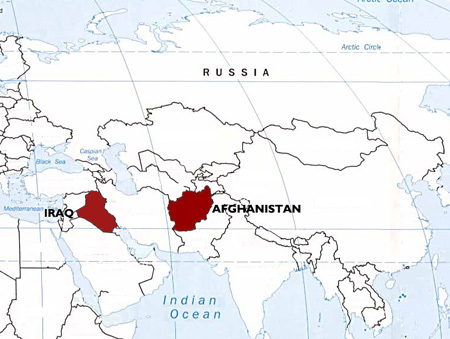 Pretty sad that you got Afghanistan and Iraq wrong at first. They’re on either side of Bush’s arch enemy. Anyway, the only reason I got those two questions right is because of War and Travel, which if you think about it aren’t very much different. Do us all a favor and try to keep that in mind as you blog. Consider yourself more knowledgeable on geographic matters than most. According to this 2002 poll, only 13 percent of American aged 18 to 24 could find Iraq on a map; only 17 percent could find Afghanistan. For a more up-to-date assessment of world knowledge, this poll is interesting. Einstein said that common sense is the collection of prejudices acquired by age eighteen. With respect to factual matters, I’d say the same is true for what is “obvious.” If you know little to nothing about wine production, as is the case for most of the people in the world, I don’t think it would be particularly obvious that both Santiago and South Africa are major wine producers, nor consequently that they share roughly the same latitude. I have to admit that your comparison between war and travel leaves me baffled. Since both involve new experiences of different parts of the world, there are bound to be some similarities, but the two could hardly be called “not very much different.” For one, war is a tragedy; travel is not. I got three of the five questions right (The first, the equator for South America, and Afghanistan). By the way, I wouldn’t always say travel is a tragedy. Not as big as war, but still. Dear Nef, You are so funny. Luckily I was a Geography major…however, I will use this lesson with my Humanities class! By the way, I am sitting in your mom’s chair in front of the new Mac at your house right this minute. I cannot wait for you to come see my world next year. See you in Hong Kong! Ryan, you shouldn’t be baffled. My comparison is made following the very logic of Ambrose Bierce’s statement. War transports human bodies from one part of the world to another. Their loved ones reach for the map. Same with travel. And even if you hadn’t quoted Bierce, then for Christ’s sake you can’t tell me that you don’t understand the relationship between religion, war and travel: missionaries, then soldiers, then tourists. Look at VIETNAM for the love of God. Yes, your facile conclusion that “war is tragic, travel is not” is fine, I guess. But you can choose to look at things in a totally inane, superficial light - or you can choose to be thoughtful. I’d submit that if you’re posting regularly about your experiences in a foreign country, it’s better to be thoughtful. If your point is that war and travel are similar in the sense that both tend to involve learning more about other countries, I can agree with that. (Though I have my doubts about how much learning really occurs when countries go to war, Bierce’s statement notwithstanding.) However I understood your initial comment to mean that war and travel are not very different, and I maintain that’s just not true. War transports human bodies from one part of the world to another. Their loved ones reach for the map. Same with travel. That illustrates that both travel and war can incite people to learn about the world, but that’s a superficial similarity when you consider what those loved ones are feeling. In the case of war, the loved ones are praying their friend doesn’t come home in a body bag; in that of travel, they’re excited that their friend has a chance to experience the world. The different attitudes stem from fundamental differences: war disagrees with the other, travel values the other; travel embodies opportunity, war destroys it. I do appreciate your vote of confidence in my knowledge, but I have to admit that I know little about the history of Vietnam. In other regions I know that historically evangelization and conquest have been brothers in arms, but I can’t claim to understand the relationships between religion, war, and travel that you reference. In any event, the fact that travel and war may be connected in historical cycles doesn’t make them necessarily similar. Cause and effect are likewise connected, but one is not the other. On a separate note, your characterization of my response isn’t particularly constructive and your suggestion is patronizing. Think what you will, but if that’s your opinion, why waste your time? The world is full of ignorant people and you’re not likely to convince anyone in the space of a comment.